A 55-year-old male presented with difficulty in walking, tremors of bilateral upper limbs, scanning speech, and urinary incontinence, for the past 2 years. He was a known case of pituitary macroadenoma (PM) and was referred to our department for dopamine transporter single-photon emission computed tomography (DAT SPECT) with the clinical suspicion of Parkinson's disease. Technetium-99m labeled tropane derivative (Tc-99m TRODAT) (20 mCi) was injected intravenously and SPECT/CT was done 4 h later. Evaluation of the cine image [Figure 1]a revealed intense focal tracer accumulation which corresponded to PM on the fused axial SPECT/CT images [Figure 1]b, and on magnetic resonance imaging [Figure 1]c. As a result of this intense uptake in the macroadenoma, tracer binding in the basal ganglia was suboptimal and while the left basal ganglia showed normal binding, the right side was interpreted as normal only after a careful review of the transaxial images [Figure 1]d. To further confirm the absence of presynaptic dopaminergic dysfunction, we performed a F-18 fluoro-dihydroxyphenylalanine (FDOPA) positron emission tomography/computed tomography (PET/CT) which revealed normal tracer uptake in both basal ganglia [Figure 1]e. No accumulation of FDOPA was noted in the PM [Figure 1]f. The symptoms of the patient were subsequently attributed to the presence of cerebellar atrophy. Tc-99m TRODAT ([2-[2-[3- (4-chlorophenyl)-8-methyl-8-azabicyclo [3, 2, 1]oct-2-yl] methyl](2-mercaptoethyl) -amino] ethyl] amino] ethanethiolato (3-)-N2, N2', S2, S2']oxo-[1R-(exo-exo)]) binds to the DAT and is used for the evaluation of presynaptic dopaminergic function in Parkinsonism More Details.,,, The extrastriatal uptake of TRODAT has been reported in PM, primary brain tumors, brain metastases, meningioma, osteoid tumor of clivus, intracranial tuberculoma, and subdural hematoma.,,,,,,,, The possibility of extrastriatal accumulation of TRODAT interfering with image interpretation as in our case should be kept in mind, while planning TRODAT SPECT and alternative modalities like FDOPA PET with superior image quality and resolution should be resorted to at the outset. F-18 FDOPA is an analog of DOPA and serves as substrate for aromatic amino acid decarboxylase that converts dopa to dopamine. It can be used as an alternative for Tc-99m TRODAT, especially when the symptom duration of Parkinson's is not too short. Meegalla SK, Plössl K, Kung MP, Chumpradit S, Stevenson DA, Kushner SA, et al. Synthesis and characterization of technetium-99m-labeled tropanes as dopamine transporter-imaging agents. J Med Chem 1997;40:9-17. Tripathi M, Kumar A, Bal C. Neuroimaging in Parkinsonian disorders. Neurol India 2018;66:S68-78. Mittal BR, Sood A, Shukla J, Vatsa R, Bhusari P, Shree R, et al. 99mTc-TRODAT-1 SPECT/CT imaging as a complementary biomarker in the diagnosis of parkinsonian syndromes. Nucl Med Commun 2018;39:312-8. Sasannezhad P, Juibary AG, Sadri K, Sadeghi R, Sabour M, Kakhki VR, et al.99m Tc-TRODAT-1 SPECT imaging in early and late onset Parkinson's disease. Asia Ocean J Nucl Med Biol 2017;5:114-9. Hsieh TC, Wu YC, Sun SS, Hsu CN, Kao CH. Pituitary macroadenoma on 99mTc-TRODAT-1 brain SPECT. Clin Nucl Med 2014;39:e398-401. Chen YR, Hsieh TC, Yen KY, Kao CH. Increased 99mTc TRODAT-1 uptake in anaplastic oligodendroglioma. Clin Nucl Med 2014;39:e104-5. Wu YC, Hsieh TC, Sun SS, Yen KY, Wang CH, Lin YY, et al. 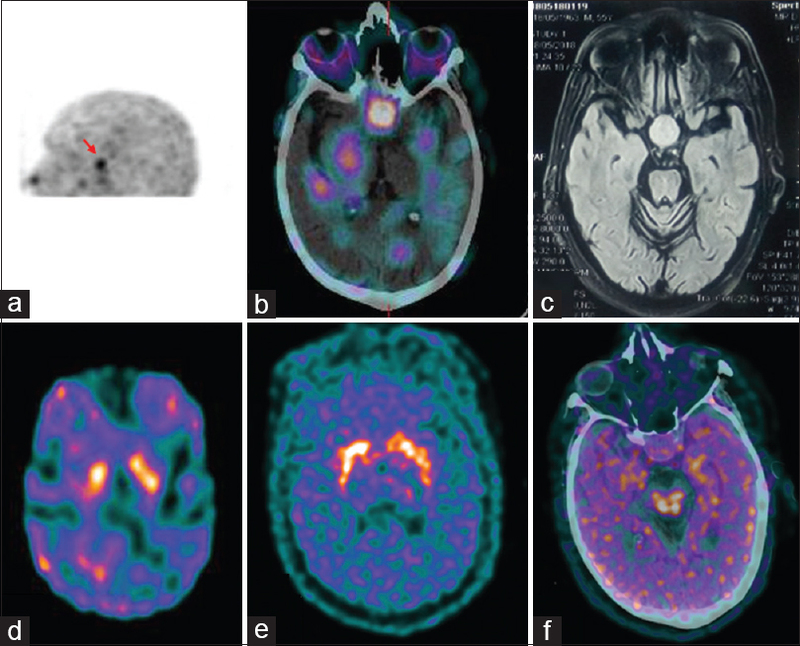 Findings of cerebral metastasis demonstrated on tc-99m TRODAT-1 SPECT. Clin Nucl Med 2010;35:107-8. Chiu YL, Hu C, Li JY, Weng MJ, Lin WC, Peng NJ. An incidental finding of cerebral meningioma on 99mTc-TRODAT-1 dopamine transporter SPECT/CT. Clin Nucl Med 2012;37:899-900. Chandra P, Nath S. Extra-striatal uptake of 99m Tc-TRODAT-1 in meningioma detected on SPECT/CT: Diagnostic clue or mere coincidence? Indian J Nucl Med 2017;32:243-4. Vitor T, Carvalho GC Neto, Nogueira SA, Wagner J, Felício AC. Incidental detection of probable meningioma in brain scintigraphy using 99mTc-TRODAT-1. Arq Neuropsiquiatr 2017;75:258-9. Taywade S, Tripathi M, Tandon V, Das CJ, Damle NA, Shamim SA, et al. Tc-99m TRODAT uptake in an osteoid tumor of clivus. Indian J Nucl Med 2016;31:309-10. Tripathi M, Arora G, Das CJ, Grover T, Gupta R, Bal C, et al. Incidental detection of intracranial tuberculomas on (99m) Tc-TRODAT-1 SPECT/CT. Clin Nucl Med 2015;40:e321-2. Hsieh TC, Kao CH, Wu YC, Wang CH, Yen KY, Sun SS. Findings of subdural hematoma on tc-99m-TRODAT-1 SPECT. Clin Nucl Med 2009;34:245-6. Huang WS, Chiang YH, Lin JC, Chou YH, Cheng CY, Liu RS, et al. Crossover study of (99m)Tc-TRODAT-1 SPECT and (18)F-FDOPA PET in Parkinson's disease patients. J Nucl Med 2003;44:999-1005.